The Michigan Life Science Corridor is a life science research consortium based at four Michigan universities: Michigan State University, the University of Michigan, the Van Andel Institute in Grand Rapids, and Wayne State University. It was established in 1999 with a $1 billion state tobacco lawsuit settlement and provided a network of advanced technology laboratories for academic researchers. The state of Michigan plans to award $50 million annually for the next 20 years to the consortium to continue to accelerate life science research and cutting edge discoveries. This $13.5 million effort is led by University of Michigan Biological Chemistry professor, Philip Andrews and includes facilities that display global protein expression patterns with subsequent identification and characterization of individual proteins by mass spectrometry. Michigan Center for Structural Biology. The Michigan Center for Structural Biology is located at Michigan State University. This $30 million center will include advanced instrumentation necessary to determine protein composition and sequence in genetic research. Technologies in this center include X-ray crystallography, nuclear magnetic resonance (NMR) and laser-based spectroscopy. The center also produces large quantities of purified protein for analysis by these technologies. Michigan Center for Genomic Technologies. The Michigan Center for Genomic Technologies is located at Wayne State University with a five-year funding of $6.8 million. The center includes a centralized core along with satellite facilities providing techniques for analyzing gene function across the genome. It is also the site of the core laboratory which purchases, stores, and replicates desired DNA sequences for distribution to other research sites where genetic analyses will occur. The $6.4 million Michigan Animal Model Consortium expand existing facilities in the four participating universities. These facilities are used for mouse modification and extensions of this technology to other species. Researchers use mice that are specially bred with altered genomes, where a particular gene is “knocked out” or a new gene has been added. These mice are used to determine the actions of particular genes and to create models for the study of human diseases. Animal pathology, cryogenics, cryopreservation, and animal repositories are also part of this effort. Michigan Center for Biological Information. Bioinformatics, as a field of study, develops ways to store and analyze the massive amount of data generated in gene and protein research. This facility will include hub and satellite computing facilities staffed by technical specialists. As the state of Michigan gears up for another round of Corridor proposal funding in 2014, it becomes evident that the Michigan Life Sciences Corridor has grown into a large research market that laboratory supply companies cannot afford to miss. 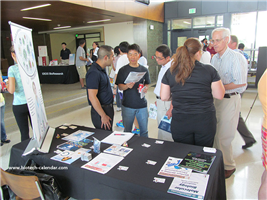 Biotechnology Calendar, Inc. organizes two BioResearch Product Faire™ Events in Michigan: at Michigan State University on July 23rd 2014, and at the University of Michigan on July 24th 2014. These events can help laboratory supply companies network with academic researchers from the Michigan Life Sciences Corridor. Each year more than 200 research professionals attend the BioResearch Product Faire™ Event at Michigan State University. Of these attendees, 53 were purchasing agents, professors and post docs, and 28 were lab managers. These attendees came from 19 different research buildings and 30 on-campus departments. If you are a laboratory supply company, please click the button below for more information about the BioResearch Product Faire™ Event at Michigan State University on July 23rd 2014. In 2013, the BioResearch Product Faire™ Event at the University of Michigan successfully attracted more than 450 attendees. Of these attendees, 139 were purchasing agents, professors and post docs, and 64 were lab managers. These attendees came from 31 different research buildings and 71 on-campus departments. Please click the button below for information about the BioResearch Product Faire™ Event at the University of Michigan on July 24th 2014. There are more BioResearch Product Faire™ Events available at different institutions throughout the country. Please read the Show Schedule for 2014.